Got a bad case of the toenail fungus that just does not seem to go away or keeps coming back? Then try a combination of Ceylon Ceylon Cinnamon Leaf Oil and Ceylon Bark Oil for a fast, cost effective, all natural home remedy against your stubborn toenail fungus. According to the Mayo clinic, toenail medication can cause liver and heart problem. Do you really want that? All other natural remedies are not fast enough and never address the internal causes. Ceylon cinnamon works and we show you how. We take a detailed look at the causes and symptoms of the toenail fungus. 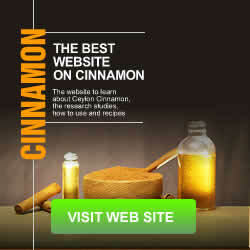 Give you six reasons why Ceylon Cinnamon is fast, effective and inexpensive. Show you how to use Ceylon Cinnamon internally and externally with step by step instructions and guide you with best practices. Ceylon cinnamon will not only kill the toenail fungus but prevent it from coming back which is what makes it unique. Candida is a leading cause of the Toenail Fungus. And Cinnamon kills Candida, even antibiotic resistant Candida. You have to treat internal causes of the toenail nail fungus for a permanent and long lasting solution. The beauty of Ceylon Cinnamon is that you can take it internally (as a black tea infused with cinnamon bark oil, sticks boiled into tea or the powder) to treat the internal causes and apply Ceylon Cinnamon Leaf Oil topically to kill and remove the unsightly mess on your toenails. And unlike Cassia Cinnamon, Ceylon Cinnamon has low Coumarin levels and will not damage your liver. Formally known as Onychomycosis, the toenail fungus affects the dark moist environment of your feet. Onychomycosis can be due to: (Trichophyton rubrum (T rubrum), T. interdigitale, tinea unguium, yeasts such as Candida albicans, and molds especially Scopulariopsis brevicaulis and Fusarium species. According to this study Onychomycosis is an infection of the nail caused by fungi such as dermatophytes, non-dermatophyte moulds and yeasts (mainly Candida species). A fingernail fungus is also possible, but there is less risk of that because your hands don’t usually reside in a dark moist environment like your feet do when you wear closed shoes with socks. That is unless you wear gloves for extended periods at work like a nurse, postal worker,shop cashier, chef or you wear artificial nails. While most people treat the toenail fungus as an external issue, the evidence indicates that a toenail fungus is primarily the result of an internal imbalance, specifically sugar, dairy, grains and nuts that can make you more susceptible to a toe nail fungus. That means the ideal treatment option is one that treats both causes. Ceylon Cinnamon Leaf Oil for topical treatment and Ceylon Cinnamon sticks or Ceylon Cinnamon Bark Oil for internal consumption to mitigate a sugar and fungi rich environment within your body. Treating your toenail fungus with just a topical treatment alone is not enough. A daily dose of Cinnamon stick tea, Ceylon Cinnamon Bark Oil or even cinnamon powder taken internally will go a long way towards combating the toenail fungus. When you begin to see white or yellow patches beneath a nail’s tip, you know you are getting a toenail fungus. If left untreated, the nail becomes thicker and brittle. Often the nail will change color and shape, becoming yellow and eventually falling off. There are 5 types of Onychomycosis. Candidal Onymychosis (CO) – Develops in patients with chronic mucocutaneous candidiasis or immune depression. Affects several or all nails. The nails often take on a bulbous or drumstick appearance. Distal Lateral Subungual Onychomycosis (DLSO) affects the nail bed and the underside of the nail. Yellow streaks and/or yellow onycholytic areas in the central portion of the nail plate. White Superficial Onychomycosis (WSO) attacks the top layers of the nail and appears as small, white, speckled or powdery patches on the surface of the nail plate. The nail becomes roughened and crumbles easily. Proximal Subungual Onychomycosisappears where the nail exits the skin of the finger or toe. Endonyx onychomycosis (EO)– Milky white discoloration of the nail plate. Candida Yeast Infection– In the United States most toetail fungus infections we believe is caused by Candida. Due to the over consumption of processed foods, dairy and sugar, Candida over growth has become an epidemic. Do a Candida test and find out. Unlike nail infections caused by contact with Dermatophyte fungi, Candida yeast nail infections are symptomatic of a systemic immunodeficiency associated with Candida overgrowth. Treatment a of Candida led toenail fungus with topical anti fungal medication alone is less effective. Cinnamon taken (cinnamon bark oil infused in tea, cinnamon stick tea or cinnamon powder) internally to attack the Candida yeast inside you is a great way to restore the balance between beneficial bacteria and an over growth of candida yeast infections in combination with topical treatment is far more effective we believe. Diet& Nutrition– According to this article there is evidence that excessive sugar, dairy, grains and nuts can create the conditions that cause a toe nail fungus. All of these foods are rich in mycotoxins but sugar is the food of choice for fungi. This is why diabetics and pre-diabetics are far more prone to a nail fungus, because of their inability to process sugar properly. According to this article from WebMd Biotin is linked to long and stronger nails. And the best natural sources of biotin are eggs, carrots, salmon, onions, tomatoes, sweet potatoes according to WH foods but avoid the nuts even though peanuts have very good levels of biotin. For people with serious case of the fungus (like having it on all toenails completely covered), we recommend you follow the Ketosis diet without the dairy and nuts they usually recommend. It gets rid of the carbs and sugar and you will lose weight dramatically as a bonus. We are talking about a pound a day. It is relatively easy to implement. Add Cinnamon and this plan it should help get rid of your sugar and carb addictions that causes much of the fungus. Read this article at Diet Doctor which provides great information. Diabetes – According to this article approximately one in three people with diabetes are afflicted with Onychomycosis (toenail fungus). Diabetics suffer from poor sensations and therefore fail to examine their feet. Injury to nail– If you dropped something on your toe nail and cracked it and developed a hair line nail crack, wearing socks can crate tiny pockets of moist warm areas where Fungi can grow. Aging & diminished blood circulation– As we get older our blood circulation slows down. Especially if we are not physically active. And that creates conditions perfect for the fungus to take hold. Weak immune system– People who have undergone surgery are highly susceptible to a toenail fungus especially if their feet were immobile for a while. But really any kind of illness that has weakened your immune system leave you susceptible to catching a toenail fungus. Warm moist environment– Constant exposure of your feet to a warm moist environment like swimming pools, baths and showers. Tight shoes– When you wear tight shoes, they tend to compress your feet, reduce blood circulation and deny your feet of air circulation. The perfect environment for a Toenail fungus growth. Socks – Those who wear socks for a long time during the day, especially in a hot humid climate, will be more prone to a toe nail fungus. Especially true of athletes like basketball players, ballet dancers, soccer players who generate lots of heat and moisture in their feet. Artificial nails – When your fingernails are covered with artificial nails, it creates a barrier to normal air flow and sunlight. The problem happens when an artificial nail becomes dislodged from the nail they are glued to and a tiny pocket forms between the two. This pocket often traps water or moisture, a prime breeding ground for a nail fungus. Wearing gloves – If you wear gloves for work (medical personal, construction workers) on a regular basis, then you could conceivably get a fingernail fungus similar to toe nail fungus. 1. A powerful anti-bacterial mold and fungus killer – Cinnamon is a powerful anti bacterial, often effective against antibiotic resistant bacteria as listed in the studies here. While we can’t however find direct evidence that Cinnamon Oil kills Onychomycosis per se this study with clove oil high in Euegnol (like Cinnamon Leaf Oil with 75% Eugenol), found prominent anti fungal actions, with a MIC (minimum inhibitory concentration) of 1% and 4%, respectively. Which means Ceylon Cinnamon Leaf Oil with 75% Eugenol will work. 2. Cost effective – Yes, Clove Oil, Oregano Oil and Tee tree oil works to an extent (if you get the real high quality versions that is not diluted), but pure 100% Ceylon Cinnamon Leaf is more powerful, usually half the price and versatile enough for many uses including disinfecting your house, improving your mood and getting rid of bad odors. Of course in order for Ceylon cinnamon oil to work it has to be the real thing with at least 75% Eugenol content which is the magical ingredient that works against the fungus. Artificial or blended Cinnamon Oils will not work because their anti-bacterial properties have been stripped away. 3. Cinnamon treats internal causes like Candida– Unlike Clove and Oregano Oils, Ceylon Cinnamon Bark Oil is far easier to take internally. Note you take Ceylon Cinnamon Leaf Oil to apply topically and the Ceylon Cinnamon Bark Oil internally. DO NOT GET CONFUSED. 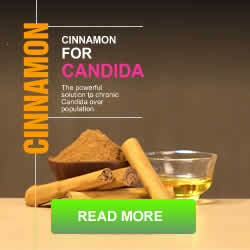 We do know Cinnamon is effective against Candida yeast as shown here, one possible cause of a toenail fungus. Cinnamon is also effective in regulating your blood sugar levels (in the 3-5% range) and thereby depriving the bacteria of an easily accessible food source, namely sugar. When Cinnamon gets to your stomach it also acts as a powerful ant-bacterial destroying all bad gut bacteria. You can also introduce good bacteria into your stomach with probiotics or eating foods rich in good bacteria like pickles. We would suggest you avoid dairy or even dairy based probiotics even though it has good bacteria. Eat Kim chi or a good pickle for an excellent source of good bacteria. 4. 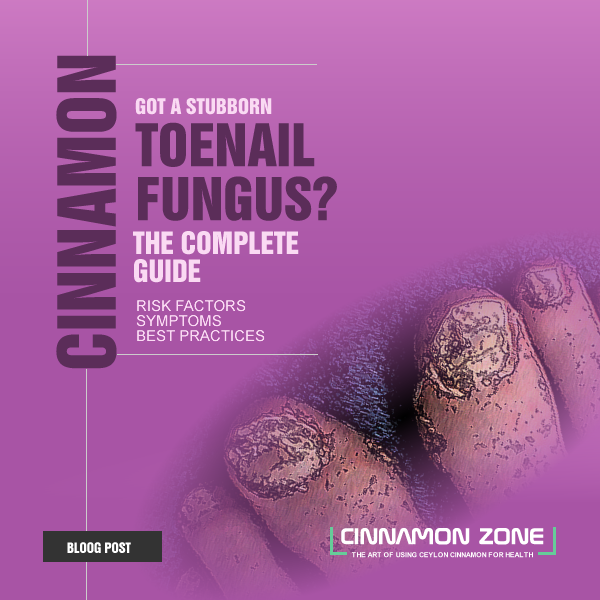 Cinnamon Works faster – Usually treatment for a toenail fungus takes months of careful treatment. With Cinnamon Oil this process is much faster. 5. Cinnamon Improves blood circulation– Cinnamon is a warming agent and improves blood circulation. Poor blood circulation in the extremities like on toenails helps the toenail fungus grow even faster. Diabetics for example suffer from poor circulation which is why they are at a high risk for getting the toenail fungus. 6. Cinnamon Leaf Oil will dry the nail faster– Unlike other natural remedies, Cinnamon Oil will dry your toenail very fast. Since moisture is the enemy of the toenail fungus this makes it particularly effective. The use of topical agents like Cinnamon Oil should be limited to cases involving less than half of the distal nail plate. Topical treatments alone are generally unable to cure onychomycosis because of insufficient nail plate penetration, but if you use 100% Cinnamon Oil on your toenail and allow it to penetrate the nail to kill the toe nail fungus, it is quite effective. But if you have broken skin or a cut, the Cinnamon Oil will burn as it penetrates. Kind of like putting pure alcohol on an open wound. Some people can handle it but others cannot. Clean first– Before you apply Cinnamon Oil it is important that you clean and prepare your toenail properly, without which you will not make much progress. Use a magnifying glass to examine your toe nail in detail for damage. If nails have thickened, cut and file them down. If you can afford it, go get a proper pedicure (ask them to wear gloves so they won’t contaminate others). Or do it at home. Seriously consider getting an electric portable manicure system like this one from Wal-Mart . It makes cleaning the toenail so much fun and easy. We also found that a V shaped cuticle remover/pusher like this is far better, easier and safer (with less chance of cutting and bleeding) to use than a cuticle snip, to remove excess cuticle. Diluted application– Ceylon Cinnamon Leaf Oil is extremely potent. So it is best to go in stages. We would suggest that mixing 1% Cinnamon Leaf Oil with water and spray the infected toe and let it air dry. For stubborn cases you may have to increase the level of concentration up to 100% depending on your needs. If you are using 100% Cinnamon Oil you can soak a Q-tip and apply the Oil. Again be warned 100% Cinnamon Oil is very hot. It’s like applying alcohol on a wound. Soak your feet– An alternative method is to mix 1-2% Cinnamon Oil with 99%-98% hot water and soak your feet for 20 minutes. You can add sea salts if you like, which can help to draw out infections. If you have a really severe case, soaking in hot water twice a week in addition to twice a day application of cinnamon oil is recommended. Use a hair dryer – If you soak your feet with cinnamon oil water solution, use a hair dryer to dry your feet after towel drying. The hair dryer can reach areas a towel cannot reach, especially if you have pockets or cracks on your toe nail. Remember to wash your foot towel separately and after each use. A set of small towels would be best in this case and it might be an idea to add a drop of Ceylon Cinnamon leaf oil when you wash the towels. Of course you might find it easier to use paper towels, which might be an even easier solution and reduce cross contamination. Using Direct 100% application – 100% undiluted Ceylon Cinnamon Leaf Oil can be applied directly to the skin or nails, but if skin is sensitive (a sure sign of broken or a cracked nail and broken skin underneath) it should be diluted with water, extra virgin olive oil or coconut oil. Usually 1-2% Cinnamon Oil to water or a carrier oil will suffice. But for people with no fear of pain, then 100% Cinnamon oil application will deliver faster results but you will waste more of the oil. At a 6% dilution rate for example Cinnamon Oil will kill a fungus within 24% hours. But that is in a petri dish. Much harder to reach the fungus in your toenail because it is underneath the toenail. So Ceylon Cinnamon Leaf Oil applied daily over time will eventually get to all of the fungus without wasting the oil. You can apply 100% cinnamon Oil but if it does not get to the toenail it can’t do its job. So make sure it penetrates, and for that your need to file the top of your nail regularly and also soak your toe nail. Never miss a day, apply everyday, twice a day– If you want fast effective results you need to be diligent and never miss a single day of treatment. Some people relax when they start to see results. Don’t! You need to go the distance and get rid of it fast. Attack it with a vengeance. Massage your feet– Mix 1% Cinnamon oil to 99% Coconut oil and massage your feet. Cinnamon is a warming agent that will help promote blood circulation. Coconut oil is also a anti-fungal agent and makes it easier to massage your feet. If you don’t treat internal causes it will come back– Some people think they can just put cinnamon oil and kill the toenail fungus. But if you got Candida or a weakened immune system it will keep coming back. Address those issues by also taking Cinnamon internally. 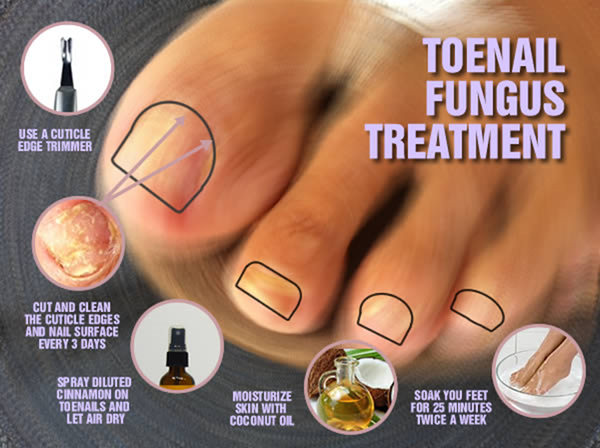 An effective toenail fungus treatment also requires internal treatment. And for that Cinnamon consumed internally is one of the most effective treatment options because it has been proven effective against antibiotic resistant Candida. Cinnamon also removes all the bad gut bacteria in your stomach. Bad gut microbes compromises your immune system, another cause of the toenail fungus. The best way to take Cinnamon internally is as follows. Ceylon Cinnamon Stick Tea – This is very easy to make. Take One 3 inch Ceylon Cinnamon Stick, add 1.5 cups of water and slow boil over 25 minutes. Then let it cool down for 15 minutes. When it becomes a beautiful red color you know it is ready. You can make a whole jug and keep in the refrigerator, but heat it again when you drink it. 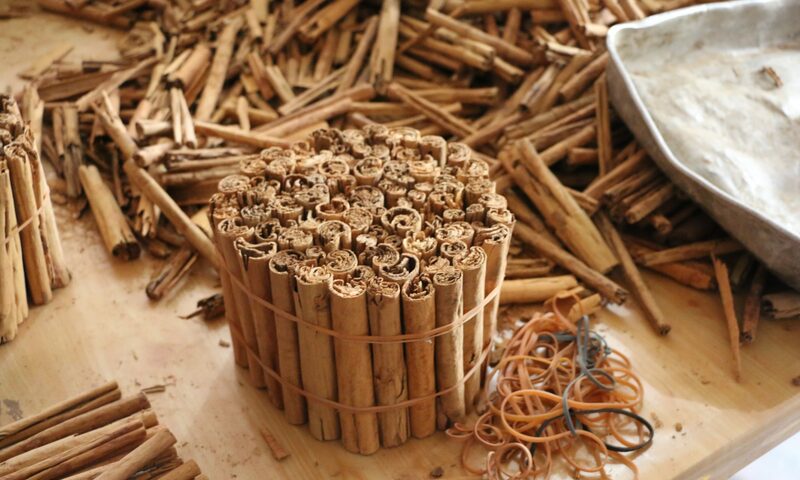 Ceylon Cinnamon Power – Although not as powerful as the sticks, you can still use Cinnamon Powder to make some cinnamon tea. Simply add 3/4 teaspoon of powder to 1.5 cups of water, let it steep for 5 minutes, strain the powder residue that usually sinks to the bottom and drink. Not bad even if it is a little messy to make. Ceylon Cinnamon Bark Oil – This is the easiest and most powerful way to take Cinnamon internally. Research shows that it the oil component of Ceylon Cinnamon that is so good for killing all manner of fungus and bacteria. This is the nuclear option and very powerful. Add 1-2 drops to 8 oz. of hot water or to your herbal tea. Be extremely careful as too much will drop your blood sugar levels not to mention being sweet spicy burning hot. Start with one drop at first. Of course make sure it is Ceylon Cinnamon and not the Cassia Cinnamon which has too much Coumarin and will damage your liver. Besides Cassia Cinnamon Oil is generally not considered good quality and has a different chemical signature. The US Department of Health says not to take more than 6g (1.2 tsp of powder Cinnamon or 1 cinnamon stick) of Cinnamon for more than six weeks with a period of rest (say about a week) after that. This because it may accumulate toxicity in your system. Yes even good things have their limits. We would suggest you take Cinnamon tea for 5 days during the week and stop on the weekend and then start again for another 5 days on Monday. That way you can take Cinnamon for a few months or until the fungus is cured. Some people also take 1/4 tsp of Turmeric mixed in water during the weekend rest days which is an excellent idea because Turmeric also controls blood sugar and is a disinfectant. But Turmeric is bitter and too much is bad for your kidneys. But a little bit in moderation added to food is fine. Commercial Products – There are three classes of topical antifungal creams: polyenes (e.g., nystatin), imidazoles (e.g., clotrimazole), and allylamines-benzylamines (e.g., terbinafine). All three are active against Candida, but only imidazoles and allylamines-benzylamines are active against dermatophytes. You can also get antifungal nail lacquers but these can be really cumbersome to use. For oral therapy there is also a huge combination of medications, often with mixed results. Read about them in this well written diabetics journal. Laser Treatment For Toenail Fungus – According to this article in Livestrong, laser treatment is not only expensive and not been proven effective. Other Natural Remedies – According to this Livestrong article Apple Cider Vinegar is a fairly effective treatment because it creates an alkaline environment in which fungus cannot survive. The only problem is it is effective mostly in a foot bath. Tea tree Oil to treat the toenail fungus according to Livestrong in this article is slow and you may not completely resolve the fungus for a year. The Mayo clinic in this article says there is strong scientific evidence that tea tree oil does not work for the toenail fungus. Clove Oil provided it has high levels of Eugenol one study shows is effective against onychomycosis. So far we cannot find evidence other remedies like orange Oil, garlic and baking soda are anywhere near effective. Frequent clipping and maintenance of toenails– Beautiful feet, especially in a women is an amazing thing and a tremendous morale booster. Pamper them. Make them look good. Cut and file every 3 days until the toenail fungus is cured. Thereafter examine you feet, cut, file and look after your toenails once a week. Air your feet– Allow air to reach the infected toe as much as possible. Moist socks and shoes breed fungal growth. Go barefooted as much as you can. Wear sandals whenever possible. Do not wear your sock or hosiery more than one day without washing. White socks that can be bleached are a plus. Change your socks & wash them properly– When you notice a toenail fungus throw out all your socks and start with new socks. Low temperature washing machine are not hot enough eliminate fungal spores in socks, so wash your socks in real hot water. Spray Ceylon Cinnamon leaf oil on the inside of your shoes – Since shoes are rarely washed, spraying 1% diluted cinnamon oil on the inside of your shoes and allowing them to air dry them overnight will help any lingering kill fungal spores that has contaminated your shoes. Sneakers are easier to wash. If you don’t want to wash them you should at least sun dry them. Avoid wearing tight shoes. – Tight shoes push your toes together, potentially transferring fungus and often creating the perfect moist, warm and closed environment so beloved by fungus. If you like wearing heels, it might be a good idea to take a break from them if they’re bunching up your toes. It can also help to shift to wearing only shoes that “breathe”. Tight hosiery can cause similar problems. Dry your feet thoroughly after getting wet. After bathing, swimming and any activity that leaves your feet sweaty or wet, dry them thoroughly. Use that hair dryer. This will help keep the infection from worsening. Be especially careful of public pools and similar opportunities to spread your infection. Avoid these places or find ways to keep your feet covered. Stop sharing manicure utensils– To reduce your risk of nail fungus, it’s important to avoid sharing manicure or pedicure utensils with other people. Very common at the nail salon so make sure they sterilize the equipment first. Add Ceylon cinnamon oil to your foot cream– If you use a cream add a few drops of Cinnamon Leaf Oil (no more than 1-2%) to your cream and rub it in. Or just spray or rub your foot with the 1% Cinnamon and 99% water solution and then apply any foot cream you may use. Or better still use the coconut oil mixed with the Ceylon Cinnamon leaf oil. Eliminate sugar & dairy – You must eliminate sugar and dairy, at least for the duration of treatment. This is because Candida, (which causes the toenail fungus in many cases), feeds on sugar which dairy products have in high doses. At least reduce until your toenail fungus is under control or eliminated. Eating a balanced diet rich in nutrients helps promote a strong immune system which is vital to the toenail fungus cure. We have discovered most people who have a toenail fungus also have very poor eating habits. Many take medications and other supplements that often leave your immune system very weak. Getting vitamins and minerals from natural food is significantly better than popping pills especially B12 and Vitamin D3. Massage your feet and toes – Get into the habit of massaging your feet or getting a foot massage from time to time to improve blood circulation to your feet. As we get older we suffer from diminished circulation. Cinnamon helps blood circulation but it can’t do all the work by itself. Perhaps doing some sort of sports that involve your feet is an option. Dancing perhaps? The toenail fungus will heal more slowly – If you have diabetes, peripheral vascular disease or any other systemic diseases that affects the blood flow to the feet. Which is why massaging your feet is very important. Disinfect nail files and clippers with Ceylon cinnamon leaf oil– Wash the nail files and clippers and spray with the 1% Cinnamon Oil and water combination and leave until the next use. Cinnamon Oil is a powerful disinfectant but you must leave it on for it to work. Pregnant women should not take Cinnamon as it can cause uterine contractions that can lead to premature birth. Handle Ceylon Cinnamon Leaf Oil with care since it is an extremely powerful anti-bacterial and ideally dilute to 1-2% with water or a carrier oil. Ceylon Cinnamon Leaf Oil should not be taken internally except for certain specific cases like Lyme disease. Cinnamon Leaf Oil is what is best for topical treatment due to it’s lower cost and high Euegnol content. For internal consumption only use pure high quality Ceylon Cinnamon Bark Oil because it is very refined and therefore suitable for internal consumption. Ceylon Cinnamon Bark Oil only has about 20-35% Eugenol but it has 60% Cinnamaldehyde the compound that makes it an extremely powerful anti bacterial and anti-fungal. One that can work from the inside. In most cases (not all cases) you will see results within 7 days after applying Cinnamon Oil and taking Cinnamon Tea orally everyday. Yes it’s that fast. That does not necessarily mean it will be cured within seven days. All it means is you will see real and dramatic progress. The oil may make the toenail slightly yellow especially if you use the undiluted oil, but this comes off with regular cleaning and filing of the toenail every 3-4 days. The complete cure will take a few months if you have a really stubborn case. The toenail grows at about 1mm (0.03 inch) per month. If it is not working please pause to see if your sugar and dairy products intake has been eliminated and check your diet. Maybe you forgot to drink the Cinnamon tea and only applied the Cinnamon Oil? Internal treatment is as important as the topical treatment. Ensure than any medication you maybe taking does not have an adverse reaction to cinnamon. While Cinnamon is generally very safe it does not have some side effects for some people as we list here. Some people take vitamin tablets (B12 for example) laden with things like Silicon Dioxide and Magnesium Stearate. Silicon Dioxide for example inhibits blood flow, adequate healing responses, proper nutrition absorption and toxin elimination. So consider if these other factors are further aggravating your chance of recovery from the toenail fungus. We find vegetarian’s have huge issues with the toenail fungus because they are not getting sufficient nutrients (especially B12), so you need to eat eat food high in B12. Remember constant cleaning of your toenail is very important. Cinnamon Oil however good needs help. A toenail usually takes 6-7 months to grow so if you have a severe case it will take that long for complete healing. For a mild to moderate case where only one toenail is affected it should take about a month for complete recovery. The important thing is you follow all the best practices. There are no guarantees but this works 99% of the time. Each person is unique. For some people with other medical issues this may not work. Enthusiastic testimonials from many people seems to indicate it works for most otherwise healthy people. You should always consult a physician before trying this treatment option. The cost of a bottle of Ceylon Cinnamon Leaf Oil and Bark Oil is under $50. Now that is very reasonable. If it does not, you still have two Cinnamon oils that can be used for all manner of things like scenting the house, disinfecting and flavoring food.